It’s a problem being faced daily by families across Australia – dealing with decades of paperwork when a loved one passes away or has to leave their family home to move into assisted living. It’s an emotional process, sifting through precious memories intermixed with years of household bills and other paperwork. Once you’ve located important legal and financial documents like insurance policies, bank accounts and the will and segregated all the mementos you want to keep like photographs, diaries and other keepsakes, you can potentially still be left with boxes and boxes of paperwork that need to be disposed of. It can easily be enough to fill multiple recycling bins! And as well as the physical space limitations of residential bins, it’s important to take a moment to stop and think about the other risks of just throwing paperwork in the bin for roadside collection. Many families book a rubbish collection service or skip bin for throwing out a lot of old items, as well as selling old furniture and household goods or donating these to charities. It can be easy to think “Oh, maybe we’ll just throw all the paperwork in with the other rubbish too.” But it’s a risk that really isn’t worth it! Day-to-day household paperwork contains an abundance of information that can be exploited by criminals for committing identity theft and fraud. 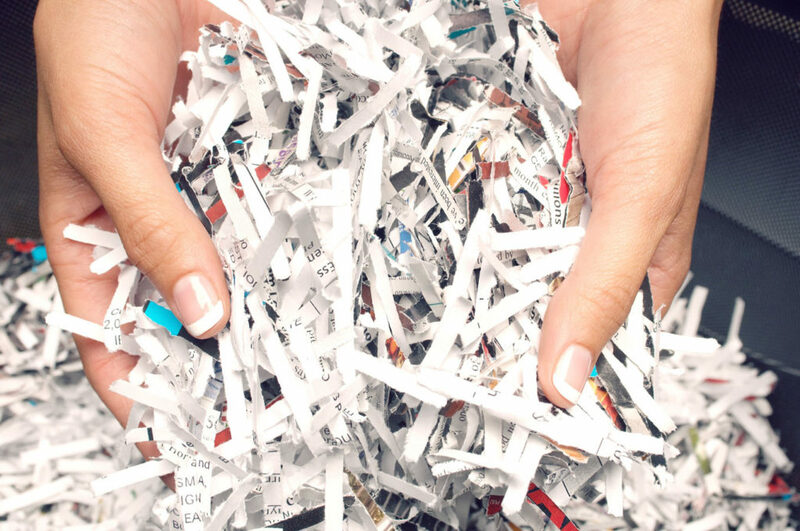 Taking steps to safely dispose of and destroy paperwork can protect your family from unnecessary trauma and additional heartache during an already emotionally trying time. It’s horrible that we even need to provide these kinds of warnings, but unfortunately identity theft crime is a growing problem that won’t be going away anytime soon. Metropolitan Shredding Service can deliver secure, locked bins to your family home, with collection scheduled after two weeks. This gives you enough time to go through important paperwork and have the peace of mind to know that documents are held in a secure, inaccessible bin until you have finished the process of sifting through filing cabinets and cupboards. Once the bin is collected, you can sleep easy knowing that we guarantee complete destruction with the highest security from collection through to transport and final destruction. After being comprehensively shredded and destroyed, the remains are sent for recycling. We can service all capital cities across Australia, plus many areas of regional NSW. To book a bin delivery and document destruction service, call METROPOLITAN SHREDDING SERVICE on 1300 677 074.